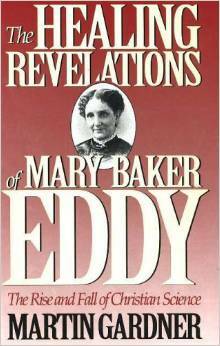 The following is a review of The Healing Revelations of Mary Baker Eddy: The Rise and Fall of Christian Science by Martin Gardner, as written by guest contributor Bacon. To be entirely honest, I’m incredibly glad that I read God’s Perfect Child (Fraser) before trying to wrap – nay – braid – my brain around, among, betwixt the texts within this scrambled maze of original sources (cool!) and snide criticism (oy). The Healing Revelations seems quite promising from the aspect of historical context, and it provides ample fodder from original sources that are almost as dated and contrived as Science and Health…. it’s good to have the context filled in a bit that Fraser referenced. HOWEVER, Fraser was able to keep her work ordered, objective, relatively unbiased and easily accessible by the layperson. Gardner throws you on a literary rollercoaster. Perhaps Gardner’s work seems a more challenging read because it is so dated; constant references to celebrities (Shirley MacLaine gets plenty of coverage) and the assumption that readers were adults of the 70s or 80s (or aware of the gossip at the time) is a bit daunting. Apparently the book started as an article and it grew with frustration and the absurdity of the religion — that much definitely rings true. Healing Revelations is a work plainly written out of frustration and would easily be dismissed by active Christian Scientists or their sympathizers because of the author’s obvious bias. The nature of the book, of course, spirals in and out of various issues within the religion and keeps self referencing in order to touch on relevant points as often as they surface, but detracts from the overall readability. It does flesh out some of Mary Baker Eddy’s life and legal adventures, along with her perceived competition and the offshoots of the religion which are not as thoroughly covered in other texts. It’s not a short read, though you’d expect it to be. It’s certainly not an easy read. Much of the content focuses on the plagiarism claims of the Quimby era and how Christian Science influenced/was influenced by the New Thought movement. Overall, the book does give perspective as to how CS was able to gain such a rapid foothold when it did, which isn’t as clearly outlined in Fraser’s book, but it goes to such lengths that it bogs in the personal lives of MBE’s contemporaries and loses traction. A worthwhile read for context, but definitely not suggested as a first, second, third, or fourth look at the shortcomings of Christian Science. The following is a review of “God’s Perfect Child: Living and Dying in the Christian Science Church” by infrequent guest contributor Bacon. My own thoughts (and a section-by-section break down) of GPC will follow in good time. “God’s Perfect Child: Living and Dying in the Christian Science Church” one reaction to Caroline Fraser’s work of subversive brilliance. Due to the constraints of composing this review on a phone, it will merely be some gut reactions and oversimplifications. I trust any readers who are interested in further reviews will find them online. My motive for reading the book was simple: I was out of CS and others who were also out had strongly suggested it. I ordered my copy and let it sit for at least a week before I even remotely wanted to pick it up. My upbringing in Christian Science was not particularly traumatic and I am squeamish but aware of the atrocities that have occurred in the name CS “treatment,” so I was not particularly looking to indulge a morbid fascination so much as find reassurance that I was not alone in a surreal and misguided upbringing – and that leaving the religion was justified. I’m not sure why I felt the need to seek external validation in book form, but I knew so little of the religion itself – merely what passed as precedent – that I felt more context was needed to honestly face the religion that so oddly shaped me. God’s Perfect Child is organized in a way that makes beautiful sense to me. I had very little context regarding Mary Baker Eddy’s life beyond a vague notion that she lived in the 1800s and fell on ice in Massachusetts and was healed by reading the Bible. Certainly, I knew it was oversimplification, but I lacked further desire to read into a person who clearly wanted attention by saying that she did not want attention….. I was too caught up in “Love is reflected in Love” and trying to pull logic out of confusing words in Science & Health to worry about a human who wrote a book, “divinely” inspired or not. Parts I and II look objectively at MBE’s baffling history of family and relationships and dissects a bewildering array of housing and allegiances and dependence. Her thoughts on her own religion prove quite similar to those who she sought for help – plagiarism, even – and in context, the whole world she built around herself was a bit maddening. Power, wealth, fame, paranoia, MBE and her rise to prominence are beautifully researched and depressingly all-too-human. Not just human, but what feels like a case study in some form of mental illness. If nothing else, GPC starts with a history of MBE and the church that are eye-opening and actually less critical than I expected, at least. The rest of the book delves into the unresolved issues of the church and its board and members: Parts I and II stand alone, together, as required reading in their own right. Part III and onward… It’s hard to explain how comprehensive GPC is in dealing with the aftermath of MBE’s death and the social respectability (fame/notoriety) of CS in the early 1900s. The turmoil of the board remains evident throughout the remainder of the book. The control of “approved” literature and attacking all opposition is a trademark that is highly alarming when considered in hindsight. The flurry of communication alternately praising and condemning the board is a bit confusing if you have no horse in the proverbial race, and this pattern repeated a few times throughout the book… At least the currents of prestige that were associated with The Christian Science Monitor were plainly set forth with some enlightening commentary on how and why the CS media risks took turns undermining itself. Appalling, as well, was the inner denial and Nixon connection: the political reach of CS was much more pervasive than I had certainly anticipated. The legal cases that are discussed in GPC are heart wrenching and I feel compelled to promote CHILD (Childrens Healthcare Is a Legal Duty) here. I had absolutely no idea how involved ‘outsiders’ were in many of these cases – rather than parents, a child, and possibly a practitioner… several cases involved multi-generational Christian Scientists who wouldn’t have known HOW to go to a doctor and between several practitioners and far, far too much procrastinating (er, praying?) there were cases of excruciatingly prolonged illness and death among minors. Overall, every single page of the book is an absolute must-read for those questioning Christian Science and/or out of it. Even better, those in CS and not questioning it – if I could plead for an objective read of an objective book, this is it. My words have certainly not done the work justice, but perhaps that’s why it exists: exhaustive notes accompany the work and I suspect it was the perfect first step in my literary exploration of non-CS works. Today’s post is by former Christian Scientist Bacon. Having health insurance is still a very new thing for me (thanks, ACA!) and having only been to the doctor twice previously (with no insurance), I was more intimidated about the paperwork than anything else… especially when I showed up at my primary doctor’s office and found out the address on the insurance card was wrong and had to call and change it to their primary location. That was about a 15 minute hassle, but I was able to go in for what I guess, for most people, is a routine checkup. And, for the ladies, the pap smear. I had a pap smear done in 2009 by a remarkably gentle, matronly sort of doctor whose bedside manner was fantastic. I barely felt anything. This round was by a younger general practitioner whose specialty was something other than easing the nerves of patients. The pap smear itself was an odd sort of prodding feeling, but on a scale from pleasant to unpleasant, it wasn’t much worse than unpleasant and at least, thankfully, very fleeting sensations. constant nose-blowing and coughing was improvement… on the bright side, in order to have blood work done, I was required to fast overnight (12 hrs of no solids, then only water until a few hrs before the sample is drawn) and return in the morning. The morning visit was when I piped up and said “I should have taken your advice about the antibiotics” and they obliged. Three weeks of medication later, the sinus infection finally let up – but I had needlessly gone an extra day, prolonging the situation which hurt only myself. Being my own advocate was something I was not prepared to do – not knowing how much of what kind of pain would require medical attention, and not knowing how to admit that I didn’t know how to handle symptoms, much less the doctor’s instructions (“what do you mean by take an over the counter antihistamine?”) …but with enough questions and patience, it’s possible to muddle through. And it’s ok to call back and say that you really should have emphasized your sinus infection instead of ignoring it. But these are the things that will be a steep learning curve, long after leaving CS, but hopefully things will get better. The following is a guest post by regular reader and sometimes contributor, the Amazing Bacon. For more about Bacon, please visit the Guest Posts & Contributors tab at the top of the page. Having been raised in CS, denial of material self is touted as one of the greatest virtues: denial of pain, injury, hunger, any material sensation, simply denying it is often enough for a healing, but affirming God’s truth is also in there somewhere, too. I’d be more eloquent, but I have been trying to block it out for years. years, I found myself in a very odd situation. 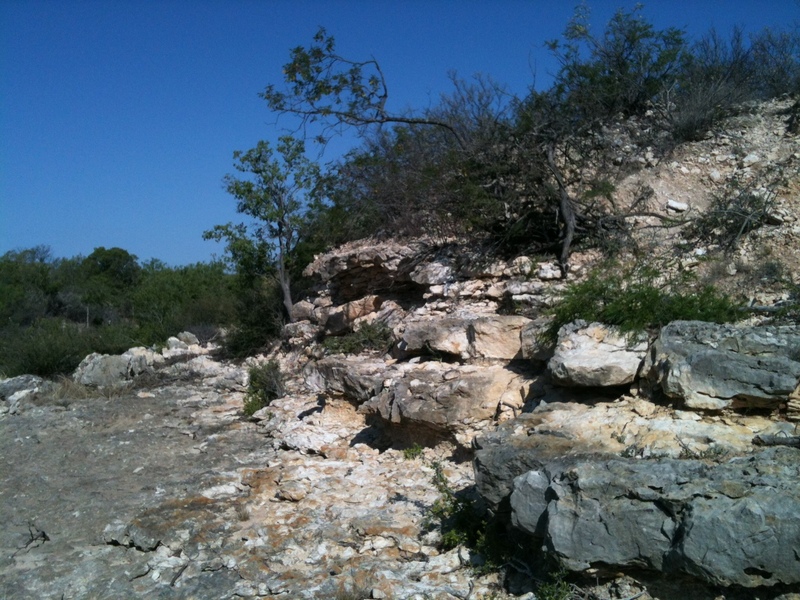 While hiking down a steep slope that was covered in loose rocks, I lost my footing. Not wanting to damage any of the gear I was packing, I leaned towards the slope and knelt down to prevent falling the remaining 6′ into the drainage. There’s no such thing as a cushy option in field work, so it was either embrace cacti or embrace rocks. Or both, plus some gravity to help. My attempt to not pitch headfirst into the drainage was a success. I slid maybe four feet and only my left side made contact: shin, hip, elbow. Elbow, a little dusty. Hip, unscathed. Shin? On fire. Obviously I was not going to “declare the Truth” because that’s ridiculous, and I was pretty sure I had just cleaved about six to eight inches of shin flesh, based on the pain shooting up my leg. After a quick assessment that no other damage had been done, and not seeing blood through the pants, I headed to my last two sites for the morning. Steep vertical slopes on the way up with easy meandering slopes on the way back to the road. About 1.5 kilometers of mixed grassland with stabby plants everywhere. Most steps were ok, but pushing through grass or shrubby plants caused agony: I could envision the skinned portion of my left shin rubbing against my pants, causing the searing burn. But I did not want to look and pass out. I made it back to the meeting point with my coworker and our vehicle. I handed her the keys and told her she might have to drive, I just needed to check out a flesh wound (first aid kit still in my field pack). So I rolled up my leg and discovered a two-inch prickly pear thorn sticking out of my shin. And then I pulled it out. And then the burn faded to a mild sting and was over within a few moments. easily treatable issues that cripple so many in CS. The following piece is a guest post by The Reader who submitted the “Don’t Give Up Now” article which inspired the “Ultimate Failure & Ultimate Success for Evil” post. They had a few more thoughts on the topic which I felt merited sharing. The only modification I have made to the post was to put The Reader’s commentary next to bullet points for easier reading. Hi there, Kindism readers. I am the reader that submitted Evan’s blog post. Please bear with me. I was raised in Christian Science and stayed with it until quite recently, though my thought process was far ahead of me. As an enthusiastic and voracious reader, non-fiction appealed to me and I realized that the Bible was really a horrible thing when taken literally, and a very contradictory text as well. I preferred Science and Health for its poetic feel that did not rely on parables. It seemed almost a whimsical snapshot of MBE’s time, when put in historical context. Let’s move on to Evan’s post – I’d followed his blog for a few years and while I’ve often found myself challenged by his statements (and challenging them, as well), this was the last straw. Please read it in its original form first, as the commentary breaks up the gloating. The below is a letter I wrote in reply to a Christian Science practitioner who was very discouraged and disheartened after praying for a patient who eventually passed on. She was wondering whether to stay in the practice or not. I’m glad you wrote, and I’m happy to answer your questions. You are in work most needed in the world today! Don’t for an instant, let mortal mind tempt you to believe otherwise. …not happy with what you’re doing? Keep doing it! Second guessing CS only makes you actually THINK about its relevance in the world today. Doubting it would be scary/wrong/not-patriotic. If it weren’t for Christian Science, what would you do? You have no other options. You’re a CS practitioner, you have no other options. You’re CS, you have no other options. Also, you can’t leave CS because then CS would see membership numbers drop. Where would you go for help? You have no other options. Seeking other options would be “aggressive mental suggestions” trying to lure you away. The implication is that the practitioner is IN NEED OF HELP. Yet only CS can help her? She lost a patient, there is grief, and there are ways to deal with grief outside of prayer. But let’s say this is a hypothetical future need of help – the implication is still that there is NO help outside of CS. Chilling. How would you even begin to find the kind of quality spiritual healing you’ve known over the years? Oh snap. If you’re doubting now, you’re denying the healings you’ve had in the past. How inconsiderate and ungrateful of you. And those healings that didn’t happen and you’re still “working on” – those will never be healed if you give up on CS because CS is the only option. Do you trust the medical community to solve all problems? Of course not, because CS is so entrenched in avoiding “the medical community” (cult?) that the mere mention of it causes the “good” CSist to get defensive. Also “trust” is a big word when followed by “solve all problems” – because medicine is not based on trust nor Solutions. It is based on research specific to each challenge. MBE allowed that bones should be set if needed; that gets the ball rolling. Why is this a problem? Do you believe the medical model has all the answers for health and healing?? I don’t think so. Of course not. Because your letter is the epitome of what is wrong with CS today. People are dying under medical care every day. No kidding. People also die without medical care every day. It’s called ‘life’ and it ends with ‘death’ and statistically speaking, it happens to EVERYONE. Let’s not pick on people who are trying everything they know of to live, but also seeking medical help for what ails them. Although doctors do their best, and we are grateful for their unselfish service, for the most part they do not know how to save people from the growing number of aggressive diseases spreading throughout humankind. “Although doctors are good people, we should burn the witches!” Witches, doctors, interchangeable. So, what are the alternatives? It’s Christian Science. Christian Science is the hope of humankind. Option A is Option A. Option B is Option A. Option C? Also Option A. …or you could volunteer at a hospital to cheer up kids with cancer. But you won’t do that because that would be giving power to false mortal beliefs. Also because you’re already a Christian Scientist, you might as well be one of The Chosen People because you’re already So Much More Enlightened than all of those other feeble people who go to doctors. And you are one of the early pioneers who has caught the vision of Truth sufficiently to help your fellowman through it, and lead the way out of mortal mind darkness into the Light! Don’t go to the Dark Side. All pioneering is tough work. There is nothing simple and easy about it. But it’s fulfilling; it’s exhilarating. It’s extremely rewarding if you stick to it and don’t give up prematurely before the work is finished. If you stick to it and fail, you were not trying hard enough. This is why so many CSists vanish. They have a challenge that CS is not helping with, so they take the “medical route” and then feel alienated. Very sad, and very telling. Yes, you and I have much to learn about how to be more effective Christian Science healers. We’re obviously not perfect, but why trust doctors and specialists when they’ve been through school and training? I daily pray and yearn for greater success. But I KNOW beyond doubt that giving up is NOT an option. That would be the ultimate failure, and it would be the ultimate success for evil. 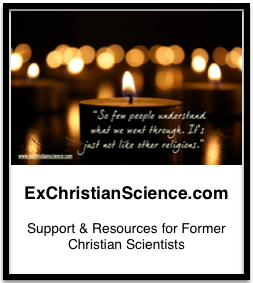 You, as a Christian Science practitioner, bring the hope for humankind! There is no other greater hope than Christian Science. Religious fervor, much? How do we expect different religions to coexist with this mindset? There is no other place for people to inevitably turn except to Truth to find their health and well-being. There is no other system of healing in the world that can do a better job of demonstrating Truth than the system you’re in now. See also: anything other than CS = evil wins. I encourage you to keep practicing the best you know, love the best you know, and keep responding to those who ask for help the best you know. That is what God asks of you. And keep praying to be a clear transparency for the love of God in the experience of the patient. You will bless every single person who asks you for help. Patients call you because they sense something in you that can help them. And they are correct. Don’t doubt the hand of Wisdom guiding them. You can help them and will. Don’t fight it. There are no other options. For them, or you. Your deep spirituality did your patient great good and she knows it. Maybe next time you can offer to support her in whatever path she takes, except I’m willing to bet that she won’t even consider any other path an option. How sad. As you and I keep growing in our understanding of the supremacy of Good and the unreality of evil, we are able to heal the more difficult cases faster and more ably. …you know, like doctors do. Keep growing! Don’t give up now. I look forward to glowing reports.